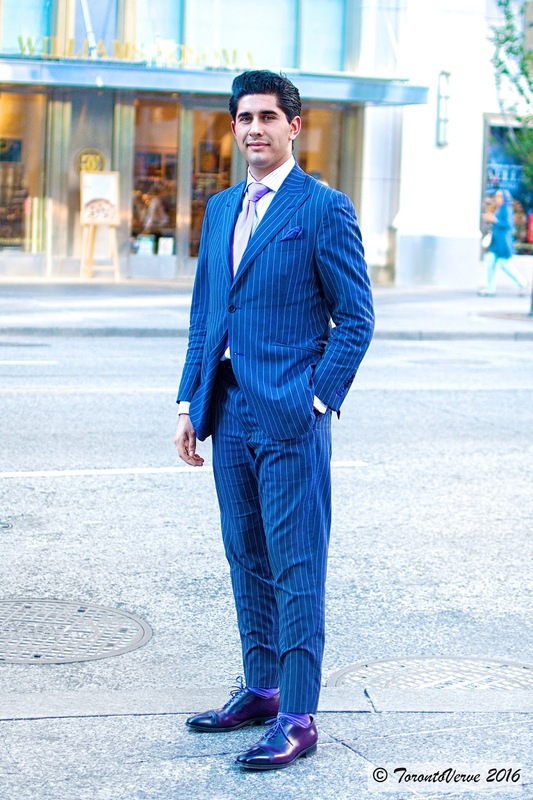 "My style is loud, vibrant and often has pinstripes. I prefer Bespoke suits. Off the rack tends to not fit or look as well. 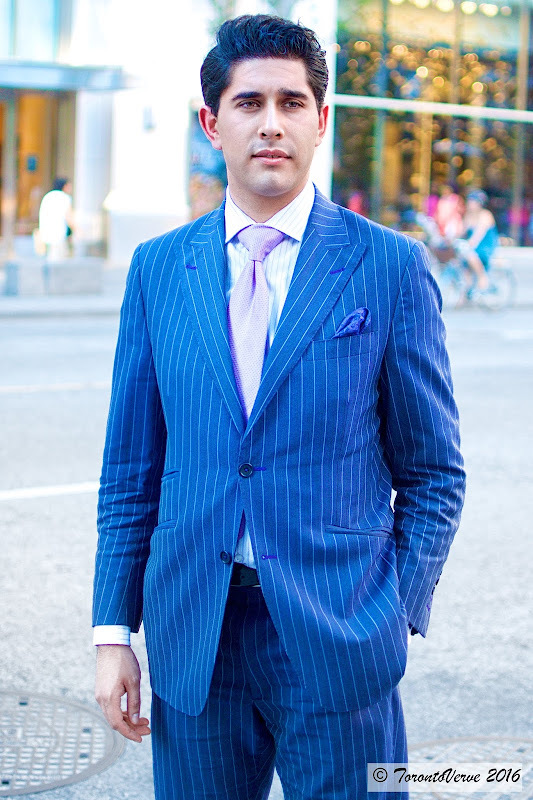 With Bespoke, I get to choose the precise colour and cloth I want. This is me." Violette: My style is mostly Korean. I prefer wearing high-waisted bottoms to make my legs look longer and slimmer. Aimee Song from Song of Style inspires me. 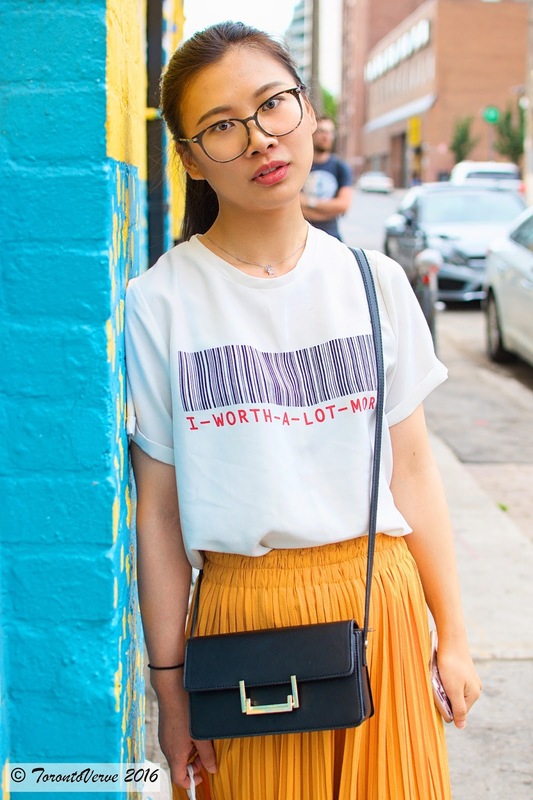 She's a popular Chinese fashion blogger. TorontoVeve: What's the best advice you've received in life? Violette: I read a saying in a book. "The greatest nutrition in life comes from being alone." That's the Chinese translation. Being alone doesn't mean you're lonely. It's OK to be by yourself -- whether it's at home, in the library, on the street or in the shower. Being alone gives you the time to reflect about your studies, career and your status. 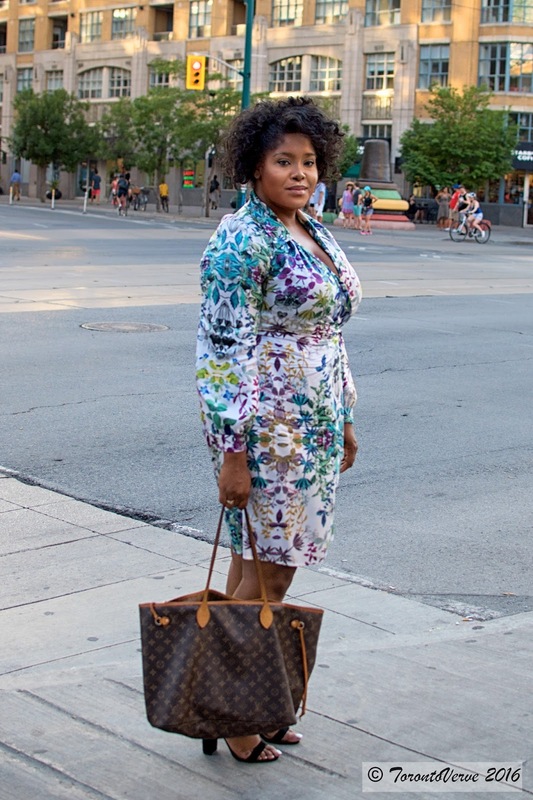 TorontoVerve made #10 on Street Style News' Daily Most Popular Chart! 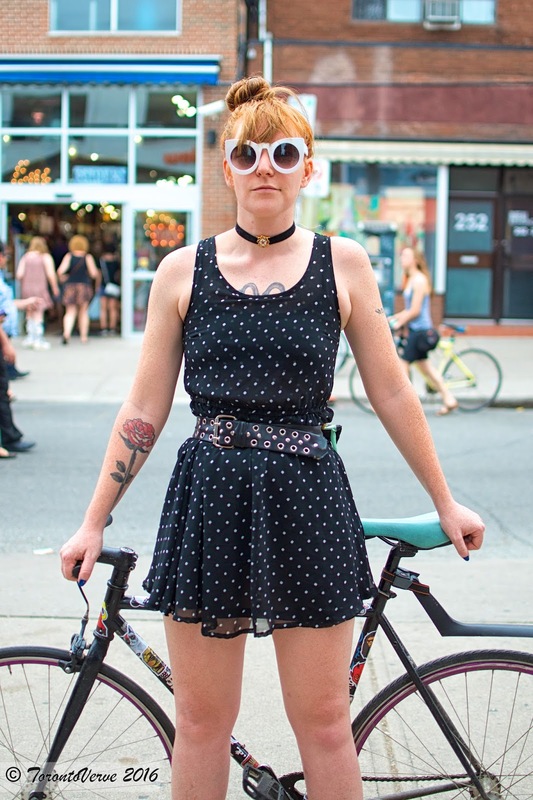 Karen: My style is both feminine and masculine. It's business, but sparkly. I'm really into the way Kristen Stewart dresses right now. Her fashion is androgynous, monochromatic and minimalist. I think it's important to not define people by gender. When you can't place a gender on a look then it forces you to be critical about someone's personality and style. If fashion is too feminine or too masculine, it's really easy to fall into the archetype of what a person is supposed to be. I think if there's more of a grey area, there's a lot more room for people to question who you are and what you are and not make snap judgements. TorontoVerve: What's the best advice you've received in life? Karen: My dad gave me the best advice. He said, "Take risks. What's the worst that can happen?" You have to ask yourself that question when you're scared about a certain situation. The answer almost always is, "Nothing too bad." 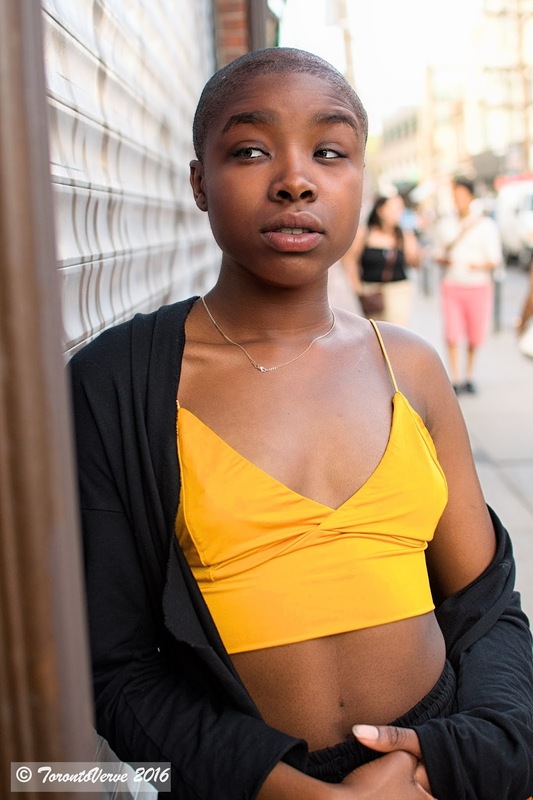 Cheyenne: My style is a mixture of the modern with the 90's grunge. Alexander McQueen inspires me. He was and still is the king of fashion. Every one of his runway shows was theatrical. An Alexander McQueen dress wasn't just a dress, it was a prominent message. Cheyenne: My mom told me, "Never give up." I want to get into modelling, but I"m a little shorter and wider so I get a lot of "No's" and slammed doors. By never giving up, I've also had a lot great experiences. "I try to be elegant and edgy. Audrey Hepburn inspires me. I love fifties fashion -- the high waist lines, winged eyeliner and red lipstick. Anything that's classic beauty." 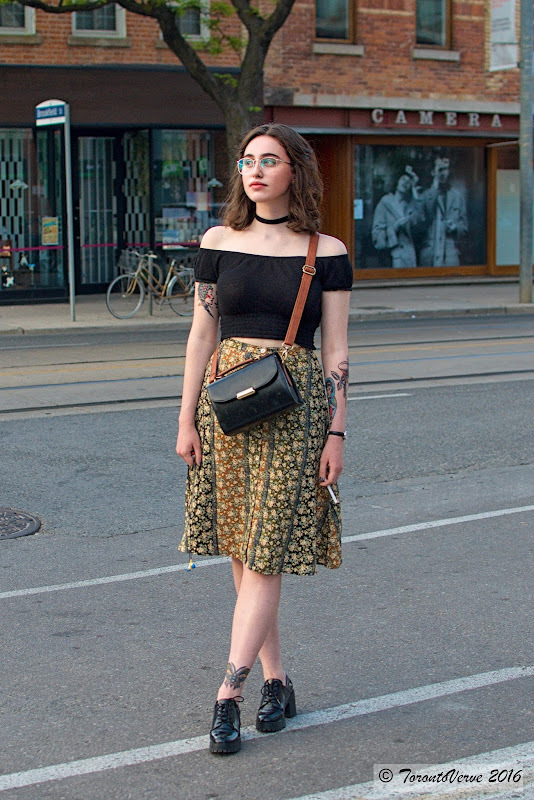 TorontoVerve made #3 on Street Style News' Daily Most Popular Chart! 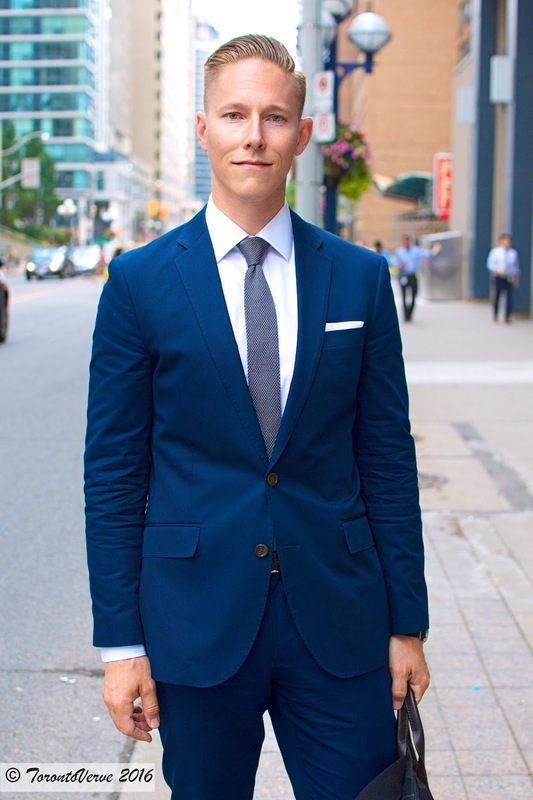 Jeff: When it comes to business attire, I always stick to solid coloured suits with white shirts. Jeff: A business colleague gave me the best advice. He said, "always know what you're talking about." In other words, don't spout off about something that you're unsure of because you'll look like an idiot. TorontoVerve made #6 on Street Style News' Daily Most Popular Chart! Emma: My mom inspires my fashion. I used to wear her clothes a lot growing up. She always looks well put together no matter what she wears. You'll never catch her in sweats. 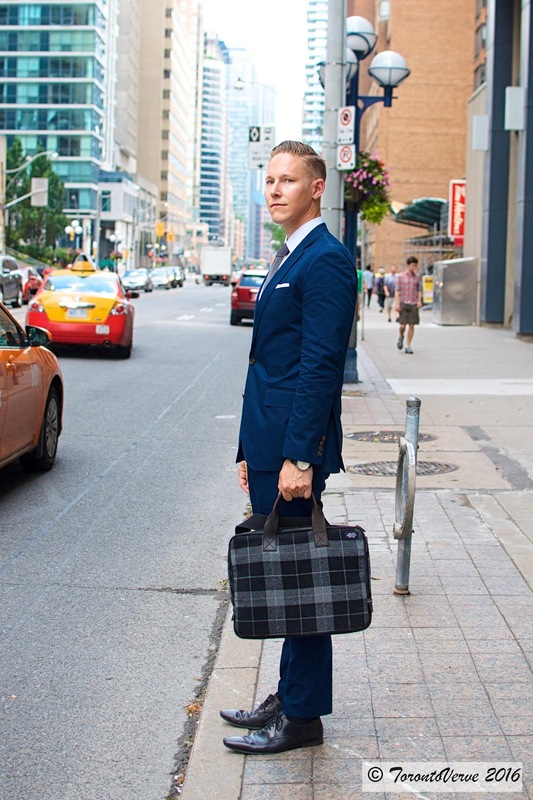 TorontoVerve: Does that mean we'll never catch you in sweats? 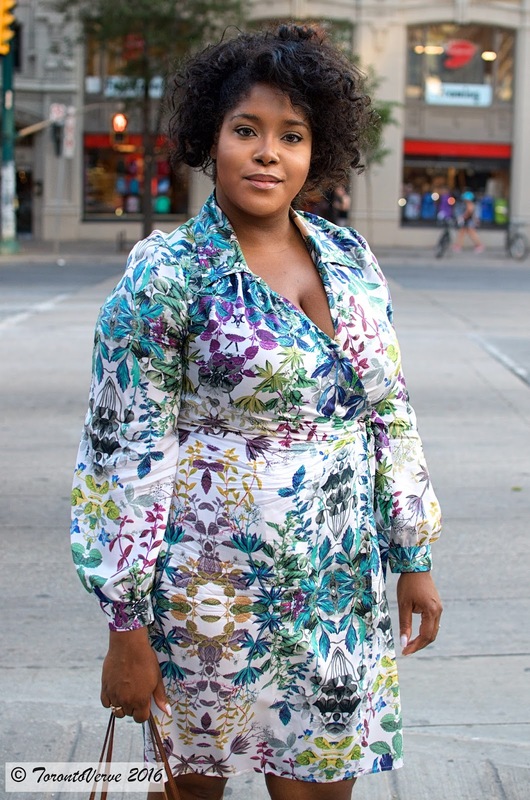 TorontoVerve made #5 on Street Style News' Daily Most Popular Chart! Jacobi: I have a tomboy style. Alexa Chung inspires me. She gorgeous and can pull off anything. Jacobi: My dad always said, "if you always do what you always did, you always get what you always got." It's helped me to push forward and do new things. Jacobi is a makeup artist. Follow her on Instagram. Holly: My style is eclectic, comfortable and colourful. Gwyneth Paltrow inspires me. We're similar in age and life-stage. I find that she's always searching for the best in everything. She's great at putting together vibrant colours that work well with blonds and fair skin tones. Holly: A good friend told me to always strive for my hearts desire. The world is your oyster -- just go out there and attack it. That's helped me gain the confidence I need to pursue my daily inspirations and ideas. I just created a pop-up shop in Muskoka and I would have never done that if I didn't have the confidence. Follow on Holly on Instagram. 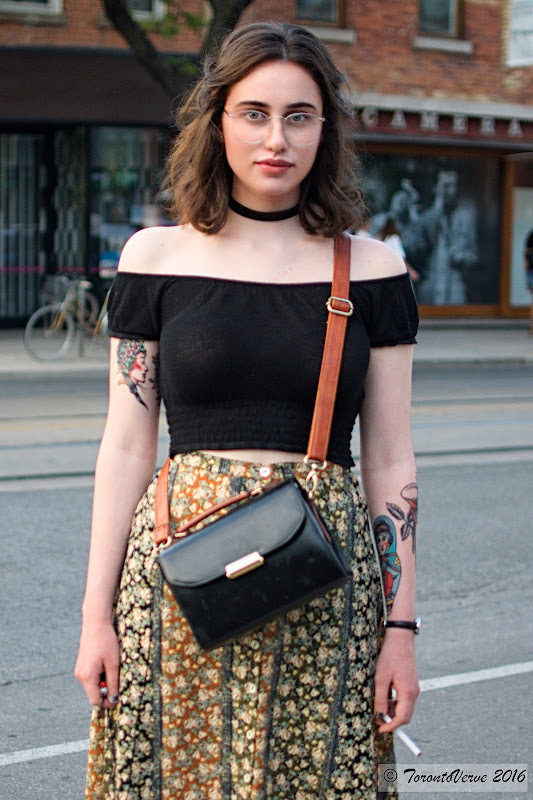 TorontoVerve made #8 on Street Style News' Daily Most Popular Chart! 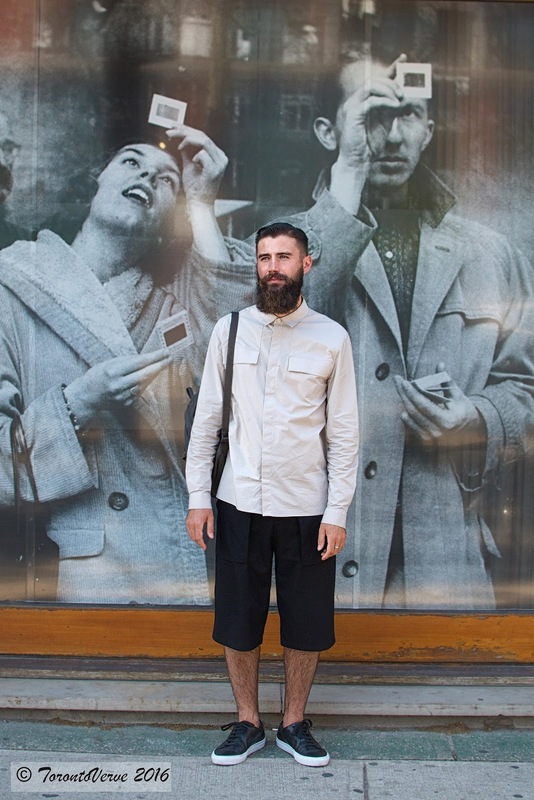 Adam: My style is modernist and inventive. I'm buying a lot less clothes now. I think in general people should buy less clothes. It's better for the environment and it's more sustainable. Stephanie: I love patterns and colours. Anything fun and flirty. I'm very girly and I'm obsessed with shoes. I'm inspired by Blake Lively. I like how she mixes high and low. She wears expensive dresses with casual shoes or cheap dresses with high-end shoes. Stephanie: My grandma told me that life is too short to worry about everything. It's helped me de-stress. I don't worry about all the little things because you can't fix everything. Keeping it all in prospective is very important. "I love colours. Wearing colours makes me feel alive. When summer comes around I feel more outdoorsy. All the colours of the flowers -- I feel like I'm a part of them. My style is being a part of my surroundings. I'm especially inspired by the 70's era. There was so much colour back then." Leah is a budding filmmaker and will be going to film school next year. "I love Terrence Malick. He's very conceptual and makes you think." Check out Leah's Stories on YouTube and follow her on Instagram. Stephanie: I used to study fashion in New York. I'm old school so I'm into Chanel and Dior. I love the gowns and dresses. Stephanie: My mother told me to start moisturizing at a young age [laughs] and that's what I teach my daughter too. "I wanted to wear the least amount of clothing today and this dress was the smallest thing I could find. 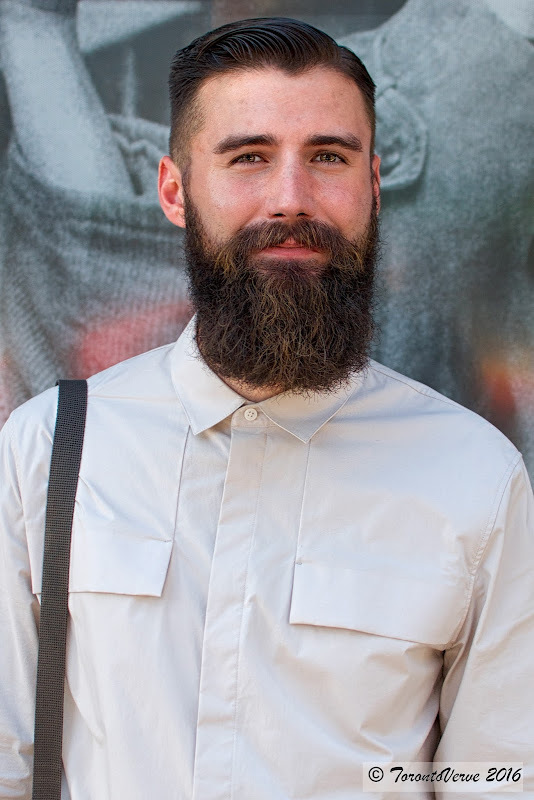 I make clothes for a bunch of fashion designers so I get inspiration from them." 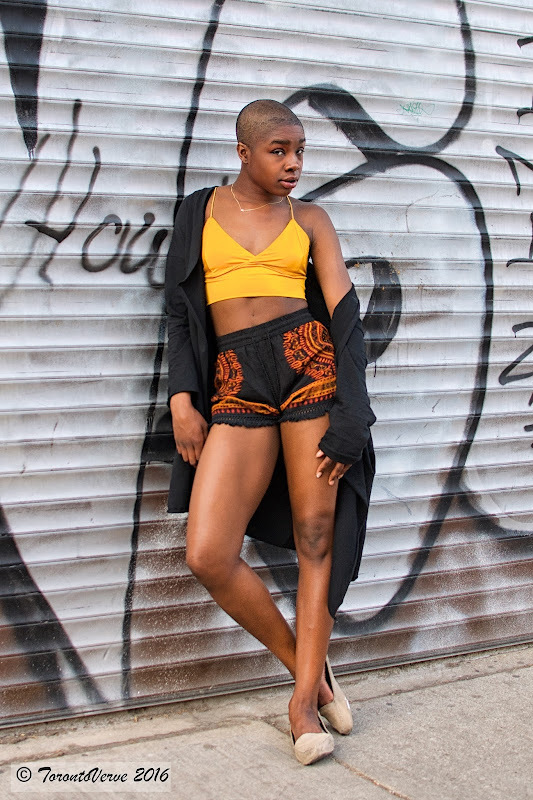 Check out Cat's website, Pigeons and Thread, to see some of the cool contemporary street wear that she and her partner, Kelly, makes for clients. Follow Pigeons and Thread on Instagram. Anna: I wear black six days a week. I really feel comfortable in black. I'm a happy person so wearing black doesn't mean I'm always depressed. TorontoVerve: What's the best advice you've received and from whom? Anna: My dad always gives me good advice. I'm Russian living in Toronto. He lives back home in Russia. He tells me "to never lie." It helps me because I feel more open with people. They know what I think and who I am. If I say something, they know I mean it. Emily: My style is a moon-child, hippie sixties-type of thing. Sometimes I'll be wearing a lot of black and other times I'll be wearing super colourful pieces. Strong feminine personas like Janis Joplin and Winona Ryder inspire me. They really kill it with their style. Emily: A friend told me to not keep things bottled up. Talk to as many people as you can. I was kind of like in a weird place with school and everything -- trying to figure myself out. Talking to a friend really helped me. "It's hard for me to define my style. I love a little bit of new school and high fashion. I mix my style completely daily. I just shaved my hair today. Rihanna inspires me. She pushes it -- especially for a Black woman. She goes either rocker or dark and I admire that."